Clint Heinze--Trashcan soccer infiltrates CBU grounds. Everyone knows about the common sports – baseball, basketball, football and soccer – however sometimes the more exciting sports are those which are relatively unknown. California Baptist University offers an open canvas for students looking to be creative in how they get their athletic fix. Sophomore Geoff Gouveia rallies his friends together weekly to share his passion for soccer, with a twist. Exchange the traditional goals with rubber outdoor trashcans, keep the rules simple, the teams small, and futbol becomes a fast paced game of trashcan soccer. “It helps with your foot skills and coordination, everything with big game soccer. I like this more than regular soccer. It’s fast, it’s physical and it’s a great way to meet new people. When you check them in the wall and they fall over, you just pick them up and keep playing,” Gouveia said. “I like that its an opportunity for all of us to get together play hard and work on footwork. Its fast with a lot of action and always room to try out that new trick you have been working on,” said Andrew Scherer. The game is always just for fun but always gets competitive as trash-talk moves across the field as fast as the players do. “Read you like an open book!” sophomore Alex Wright shouted as he kicked the ball between two opponents. Freshman Kayla Holguin described these trash can soccer games as spontaneous and fun. “We get really competitive. I have never played soccer but it’s fun to work on your skills,” Holguin said. 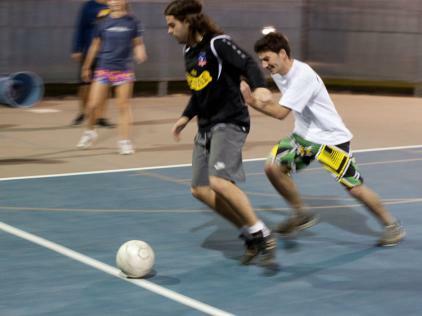 The action and physicality of a regular soccer game was present in this match as players fell to the ground. Bike polo is another obscure sport that these friends are looking to make popular around campus. Based on the same concept as traditional polo, horses have been swapped for fixed gear bikes and official polo sticks for croquet mallets. For the sake of space, the team has been playing off campus for now. Bike polo is not an original CBU creation, however, as there are leagues that compete around the world as part of the United States Bicycle Polo Association. “There is actually a league in Corona and last year the championship was held in England” Gouveia said. Community is definitely at the heart of these unique pastimes. It is not about who wins and loses, rather the relationships and bonds that have formed.